As summer is coming to a close here in the US I took the opportunity to make the most of the sunshine recently and get some quilts photographed…. I actually have a stack of quilts finished but have not got all of them photographed. This quilt was made at one of this years Charity Sew Days. Actually we made two of these tops in one day. This year the charity program has exploded in a wonderful way. This is a fun block that I have made before but I love this all solids version. The pattern was designed by my talented friend Michelle Friedman several years ago and you can find my step by step of it here… We did vary the pattern a little, using pre-cut 3 1/2 inch squares instead of strips, but the result is pretty much the same. 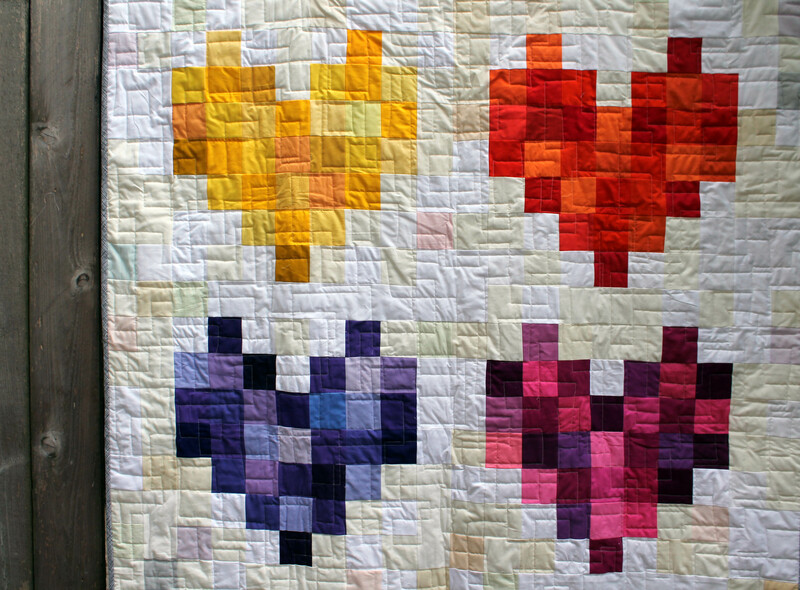 I absolutely love the quilting on this quilt, done by one of our talented long armers, Nancy Stovall. She used fluorescent green thread which was a daring choice but works wonderfully with the quilt. This quilt has now been labeled and set aside for next years Camp Erin. The sister quilt, which was slightly smaller (4 blocks x 5 blocks) has already headed out to our local PICU. Yesterday I shared the group Quilt for Pulse we made… today I am sharing my the quilt I also made for the cause. I had actually started making this quilt when we decided to make a group quilt. For my quilt I used some more of my pre-cut solid squares, but worked with my 3 inch stash this time… I have a lot of pre-cut squares and both of these projects did not even start to dent my pile! 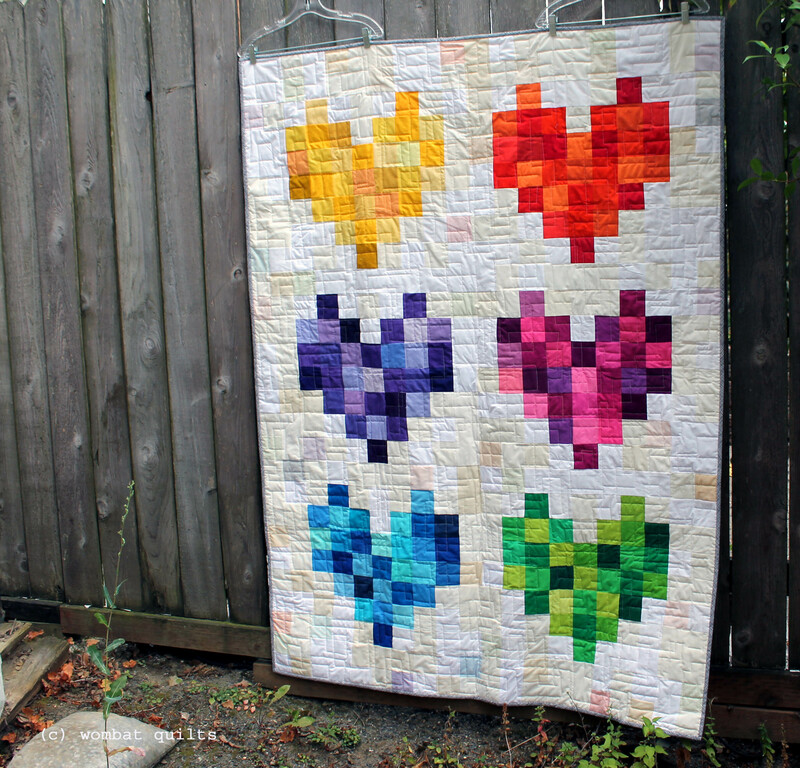 I played around on my design wall to find a heart shape that I liked and then went to work making these blocks in a rainbow assortment of colours. I made sure there was a good mix of lights and darks in each heart and used a variety of whites and creams in the background. For the background I also threw in some pastel pinks, purples, greens and blues but I made sure I did not put the pastels right next to the heart so that there was clear definition to the heart shape. 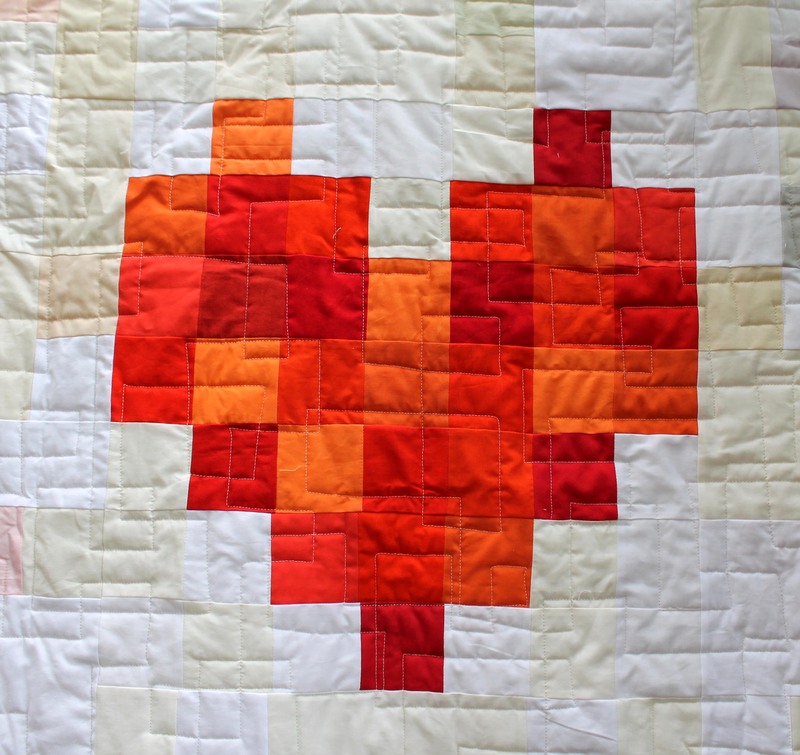 I also quilted this quilt on Modern Domestic’s Q24 longarm… I quilted this one after I had done the huge heart so I was over loopy hearts and went instead for straight line boxes. It was nice to do something more structured on this quilt. I think I am going to revisit this block. It was easy and really effective…plus I still have shoe boxes full of 3 inch solid squares! This is my second postage stamp quilt using Rita from Red Pepper Quilts technique. It is really an easy way to get all these little 1 1/2 inch squares sewn together. To make it easier on myself, every time I cut out a quilt or have some scraps I will cut a 2 x 7 inch strip and put it in a shoe box. Over the course of a couple of months that shoe box fills up. I have picked up a couple of these things over the years but never ever used them before… for this quilt I picked a waved pattern and using my trust Frixon bravely drew all over the quilt top. Some solid Kona navy binding and a label and this beauty is ready to head off into the world… hopefully it will bring a smile to some kids face. My scrap shoe box is already half full (after a busy scrap cutting session last week) so there will be another one of these in my future I am sure. For this top I used a huge stack of solid scraps that I had in my stash…including Konas, Couture Cottons, Bella cottons and some American Made cottons. I do not make a lot of solid only quilts but solids seemed like the perfect way learn to curve piece (no pattern distractions!)…. A little scrappy binding and I have another quilt off my WIP list. I am really rocking them this quarter… of course with some help from a very talented long arm quilter… it feels a little like cheating but I so love what Kazumi brings to my quilts. The good news is that I have a plenty of finished quilts to share.. because I have not blogging does not mean I have not been making…. Yep my Paper Piecing Monday green star quilt is now done… thanks in part to the wonderful long arm services of Kazumi Peterson. Last week I did a talk at a local Traditional quilt guild and while preparing my talk I realised that I had given away most of my quilts…. I have kept a handful but I wanted more to show. So there was a couple of weeks of feverish activity to get some quilts done, as well as a trip or two to my local long armer. If you are crazy enough to want to make your own version the patterns for all these stars are on the blog… you can find them under the “Free Paper Piecing Patterns” tab. To finish everything off I hand bound the quilt using a variety of scrappy solid and marbled greens…. 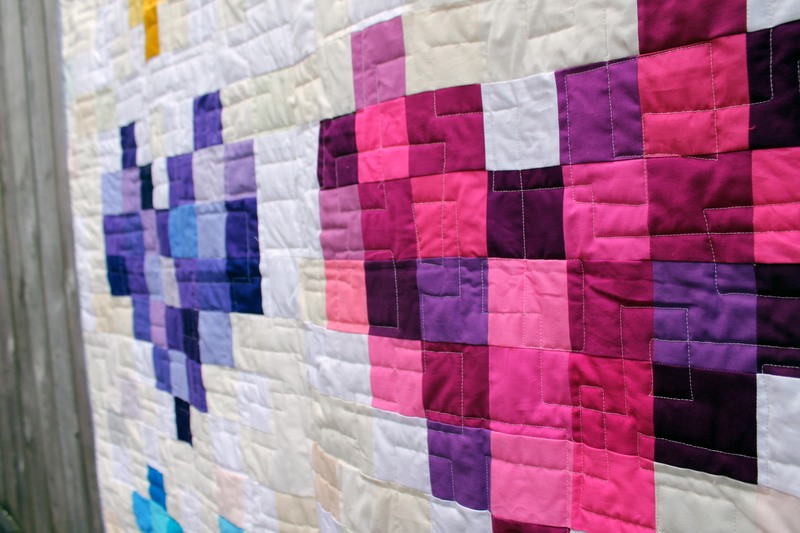 This quilt also marks another finish for this quarters Finish-Along. After a very slack first quarter I have taken a decent bite out of my WIP list, while adding only a handful of new projects to my slate! If you want more information on the Finish-Along check out Debbie at A Quilter’s Table post… this quarter’s fun is already underway but you can always join in next quarter. It really has been a wonderful way to keep myself focused on finishing stuff and not just making new WIPs!! !